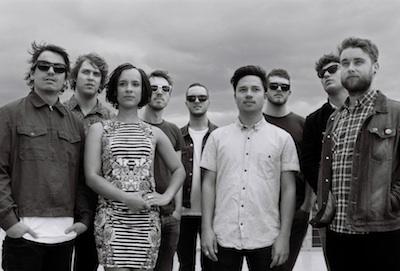 After a huge year that’s included shows with Sharon Jones & The Dap Kings, the Hypnotic Brass Ensemble and Earth, Wind And Fire as well as festival appearances at Glastonbury and Back on Black Festival in Spain, Melbourne soul powerhouse Saskwatch release their brand new single ‘Hands’… and to celebrate, they’re bringing their 9-piece soul explosion to Goodgod! Powered by the tremendous vocals of front woman Nkechi Anele and incorporating fast-paced drumming, handclaps, and an utterly ecstatic brass section, ‘Hands’ is Saskwatch at their most playful and energetic. Keen collaborators, they teamed up with Jarrad Brown (Eagle And The Worm) to produce, Julian Mckenzie (Money For Rope) as engineer and Haima Marriott to mix. It’s out now on iTunes and will be out November 1 on 7″ vinyl!